I'm gonna go ahead and apologize ahead of time to any of you that know the song these nails are based on... you're almost definitely going to have the song stuck in your head for the rest of the day. Well, technically today is "violet nails" but I say violet, schmiolet. Purple it is. And of course, when I think purple, I think of purple people eaters. If you'll please note, mine is anatomically correct, having only one eye, one horn, & a set of wings for flying, as well as a pile of human skulls from all of his people eating. The purple of the eater was done with Lime Crime Lavendairy. His horn was done in Lime Crime Milky Ways, and the outline of the horn was done by mixing Milky Ways with a bit of OPI Wooden Shoes Like to Know. His purple spots are China Glaze Coconut Kiss, and his tongue is LCN Some Like It Hot. The purple base of all of the other nails is Illamasqua Baptiste. This manicure was freehanded using, you guessed it, my favorite medium length striper brush. The spots on his skin as well as the skulls' eyeballs were done with a dotting tool. Fun fact about the song "Purple People Eater": Sheb Wooley, the guy that wrote it, finished it in less than an hour! ANOTHER fun fact, according to the song lyrics, the purple people eater in the song is not necessarily purple himself, but rather eats people that are purple. Of course, he could be a purple colored people eater that eats purple people, too. According to Wikipedia, "In responses to requests from radio DJs, listeners drew pictures that show a 'people eater' colored purple." Boy he sure looks happy about eating people, huh? Check out last year's purple nails here, and get a feel for what's on the horizon by checking out the prompts here. I absolutely LOVE this nails... it is such a cute design. Haha that last bit was funny...what a cute idea! Awww :) love it ! stop it! this is the most adorable thing i have ever seen!! 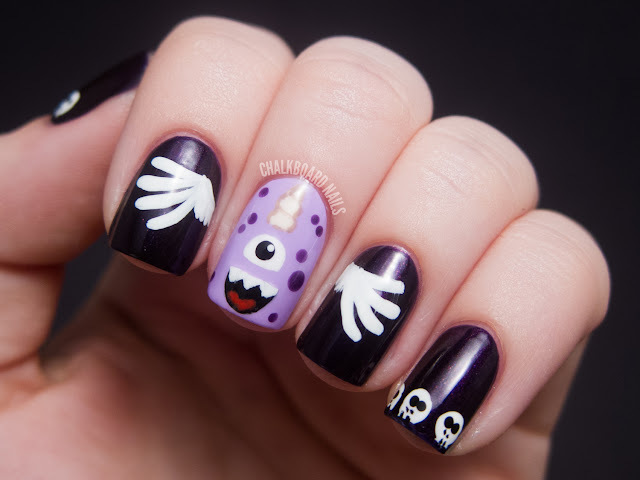 This i adorable and fun, and as always I love your amazing nails and designs! I think this is probably one of my favorites from the 31 day challenge so far! Haha I love that song and seriously I don't care if he eats people, he's adorable and I want one. LOL! This is too stinkin adorable!! Hahaha oh my god these are so funny. His face, I can't. He just looks so PLEASED for such a theoretically terrifying monster. I just want to like, I don't know. Hang out with him. Have a stuffed animal in his likeness. Your purple people eater is so awesome!! SO fun, cute and gorgeous!! Omg So cute!!!! I'm definitely going to try this out soon <3 What a brilliant idea! Very cute. Love this theme. You did such an amazing job! The "pile of human skulls". XD And I love this song-- a Halloween classic! Nice work. The people eater is done so well it looks like a decal! This is so awesome!! How long did this take? This is both awesome and adorable. Love it! I love this!! Awesome idea, you are so creative!! This is so adorable! Made me smile (and sing a little). Love it! Oh my god how awesome! You're amazing and I adore that song. This is the cutest design ever. I can't even say this enough, you rock! So cute! And I'm loving the little skulls. haha these are so cute and quirky, good work!